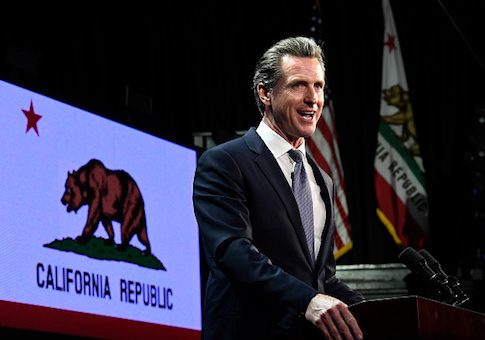 Gavin Newsom, just a few weeks into his tenure as California governor, has said he's not running for president in 2020 but he's still putting out early feelers for a possible 2024 race. The progressive liberal is running digital ads in a handful of key presidential primary states, including Ohio, Florida, and Michigan, the liberal outlet ACRONYM reports. Newsom's California 2018 gubernatorial campaign committee paid for hundreds of Facebook ads that ran from Jan. 12-16, the vast majority of which never appeared in California at all. The ads focused on a variety of progressive causes, from denouncing the government shutdown and President Trump's push for a border wall to promoting universal healthcare. All seemed geared toward testing his presidential messaging and collecting supporters' names and contact information for a larger nationwide run. "The shutdown is not something to be ‘proud' of," Newsom said in one ad that urged supporters to "REJECT TRUMP'S WALL!" "It's an avoidable and manufactured crisis—based off a wall that will be nothing more than a monument of stupidity," he says in the ad copy. " It will disrupt hundreds of thousands of lives. It's an embarrassment. That's why I simply cannot accept this absurd border wall. If you're with me, sign your name." In another, Newsom pledges to "spend every single second of my governorship working like hello to give every family access to quality, affordable health care. I pledge to be bold, aim high, and leave behind an infinitely brighter future for our kids." "The fight starts now, and I need your support," he writes. "Sign on and join me in my pursuit of guaranteed health care for all." A beaming photo of Newsom holding a microphone accompanies the ad with the words, "Join the fight for universal health care!" Below it, is an orange button with the words: "add your name." Further below, is another line: "What happens in California matters across the country." This entry was posted in Politics and tagged Gavin Newsom. Bookmark the permalink.